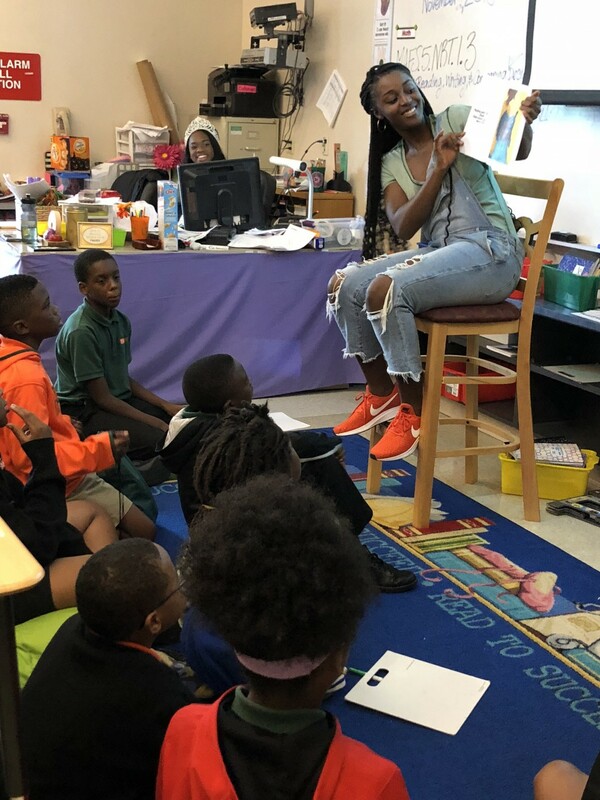 Taylor Darks reading her book "Wash Day" to the students at FAMU DRS. Taylor Darks has published two books during her time at Florida A&M University. A member of the FAMU women’s basketball team, Darks is a senior sociology major. “I remember those long road trips back home from a game: We’re nine hours away, I wake up at 2 a.m. to check how far we are and everyone is asleep. I look around and noticed a light on, and it’s Taylor typing away on her laptop, working on her book. She has sacrificed so much and put a lot of money toward her books to help entertain, educate, and spread awareness to others about embracing our innate Afrocentric self. And to me that is the definition of inspirational,” teammate Shalaunda Burney-Robinson said. Darks is from Cincinnati and she’s a transfer student from Furman University in South Carolina. “First and foremost I’m a student-athlete. So, I came to FAMU to play women’s basketball,” Darks said. “When transferring from Furman University I didn’t realize how much I needed FAMU. It was kind of like I need somewhere to go and play basketball but in leaving it was like I needed so much more than that. “I needed the education, the professors, the support, the entrepreneurship and Set Friday. I needed all of it. I didn’t realize how much I was missing out on until I got here,” she added. She originally started off trying to start a magazine. She is interested in social action and social justice. She wants people to be able to read and learn about it. “You’re going to start stuff but you have to know when to quit things that may not be working for you or when to move on. That was the first thing I tried to do. I tried to recruit people. I tried to get everything going but it just wasn’t working out. I was like I’m going to quit that, let’s just cut that off and try something different,” said Darks. She is still working on social action and social justice but she is doing it in a different media form. During her time at FAMU as well as at Furman, she has been writing a collection of poems which is title “Cage.” It is a collection of the African American experience and it originally started off as a textbook. Darks is enrolled in 18 credit hours and she’s scheduled to graduate in May, but she also has another year of eligibility left on the basketball team. She’s a red-shirt junior technically but she graduates as a senior this semester. She decided not to take her extra year. “When you transfer you have to sit a year so I still technically was on the team for four years but you get an extra year because you have to sit one. I’m choosing not to take it because I will be studying at Florida State University’s doctoral program,” said Darks. Her acceptance into the program is fully funded and she also has the FAMU Feeder Fellowship. “Writing ‘Cage' was definitely therapeutic for me because for a long time I could only write about race in poetry. It was therapeutic for me to get those feelings out and relay those messages,” said Darks. Darks used Amazon direct publishing. 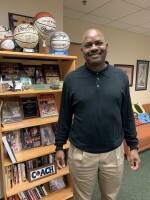 Former FAMU athletics advisor Aaron Tillman was influential with mapping how to publish Darks’ first book. “He guided what media to use and what template. He was definitely loved around here and of course by me. You always talk about putting yourself out there but when you actually do it and you see the work it’s a really great feeling,” Darks said. Darks published her book in fall of 2017 and in February 2018 she had a Black History Month book signing. She had 40 people at the book signing, then she got it on the Barnes and Noble website. Soon after the FAMU bookstore was able to order her book. Darks said that each event leading up to getting the book in the FAMU bookstore took at least two months. Now Darks’ book is used in the classroom in the Sociology of the Black Experience in the sociology department. Darks was writing the book while taking a class with Phyllis Gray-Ray, and now Gray-Ray uses it as part of the curriculum for her class. “I needed that class because they teach you about slavery, some places, but to have that really in-depth conversation about pre-slavery, slavery and post slavery, I really did need that class. Because there were some parts of the poems I couldn’t write because I didn’t know what happened. I didn’t have enough details to find in myself how I wanted to say what happened,” said Darks. In that same year Darks published “Wash Day,” a children's book. “This is my ugly stepchild. She’s Cinderella. It’s like me, as the step mom hates her but everyone else loves her and wants to give her a glass slipper. Everyone loves ‘Wash Day’ but I don’t really talk about it a lot,” said Darks. “Everything I do doesn’t fit together,” she added. “I play sports, I have really good grades, I write books, I joined a sorority, I do all these different things and they don’t all necessarily fit all in the same box. Which is a really unique brand but it’s also difficult to brand yourself.